Description: Anyone know the heritag eof this motor? It doesn't show many CP specs on it. Description: CSX westbound about to hit the diamonds at Deshler Ohio. Title: Q501-11 heads south the old way. Description: Northbound Q340 getting in the way of the shot I wanted. Description: An eastbound CSX train at Bound Brook. Description: Eastbound CSX train at Bound Brook. 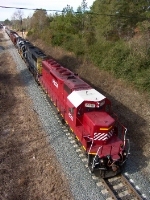 Description: Another shade of an HLCX paint scheme. Description: HLCX 6315 sits at the Cumberland deadline attached to retired CSX SD40 #4606. I still don't know what this, a perfectly healthy SD40-2, was doing back here in the deadlines. Description: Lease power in the yard. Description: This colorful lashup has just been given the green signal to proceed down the former Elgin Joliet and Eastern Rwy. Description: The 4 unit lashup starts down the tracks toward the 5th Street crossing on the edge of Gary and East Chicago. Description: With the yellow/brown grasses behind, it almost looks like a fall shot but notice the trees are actually budding out earlier than usual thanks to the mild winter and unusual heat wave that just occurred earlier. Description: Running in 2nd position in the lashup is this Canadian National unit, #5669, with HCLX 8144 and HCLX 6315 following behind. Description: The two Helm Leasing units in their contrasting red and blue liveries look clean and sharp this March afternoon. Description: Following the bluer than blue HCLX 8144 is this redder than red Helm Leasing unit followed by a long string of freight cars. Description: This Helm Leasing unit looks like it has also been through a wash lately if not the paint barn! Description: The four unit lashup heads south down the former Elgin Joliet and Eastern Rwy track after crossing 5th Avenue on the edge of Gary, IN. Description: I was shocked to get back to Keag and find this. Served up on a silver platter. Description: The treat of the day, for me, was NBSR. Description: So the sign on the signal mast says, 8144 splits the old CP lights pulling out of town. Description: On the opposite end of the bridge from my usual spot 6315 West rolls through the yard, slowing a bit due to all the guys on the ground. Description: Rolling through the yard. Description: NBSR rolls into town with 4 SD's, they weren't in town an hour before the power was turned hooked up and rolling back east with a new train. Description: After leaving their train at Hardy Pond, these Eastern Maine SD40-2s will tie up at Brownville Jct. for the day. Description: These light engines are about to pass over the HBD, a few miles east of Brownville Jct.